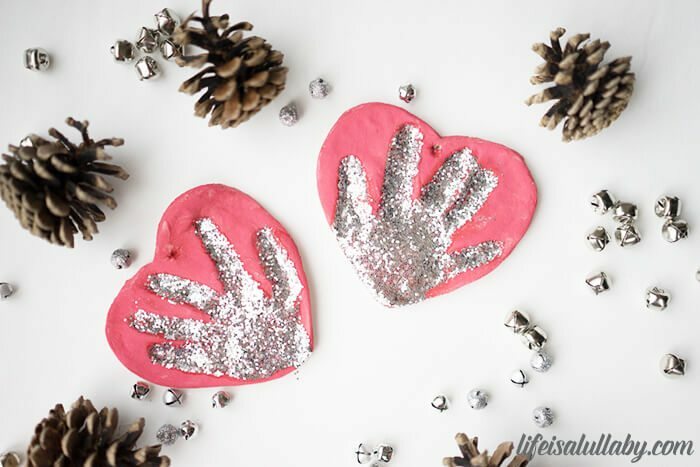 Mother’s Day is coming up, and we’ve already shared these adorable handprint salt dough keepsakes that would be perfect to make for Mom or Grandma! 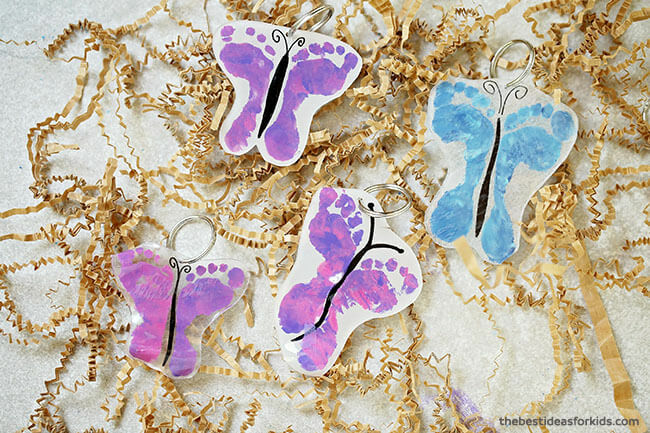 But today we’re sharing these even more adorable shrinky dink footprint keychain craft! 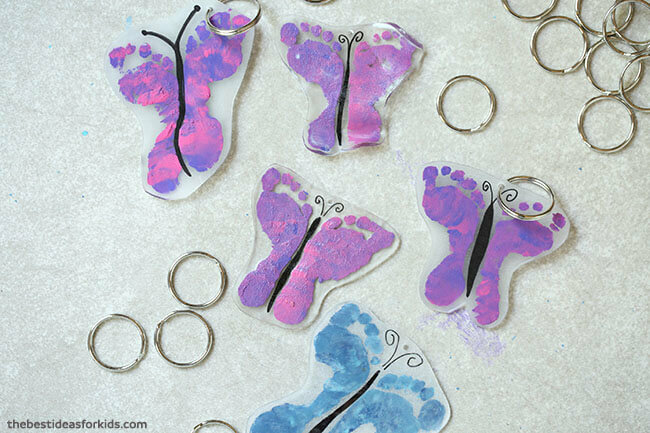 We have seen shrinky dink keychain ideas before but never with an adorable footprint. We wanted to create something for Mother’s Day that would make a lovely keepsake, but also be fun for Spring. And what’s more beautiful and spring-like than a butterfly? 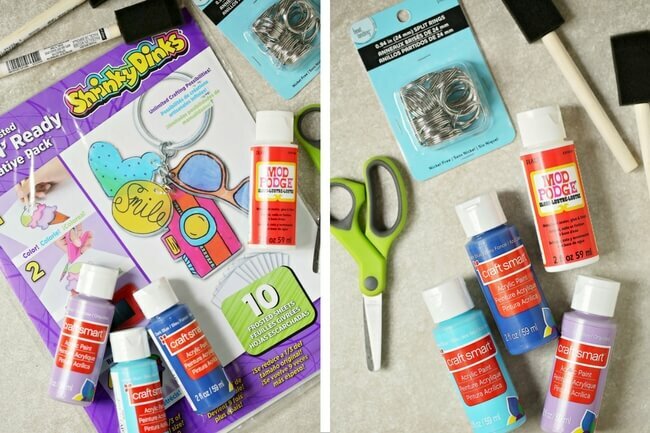 Shrinky Dink Pack – we used the frosted pack but clear would be perfect too! 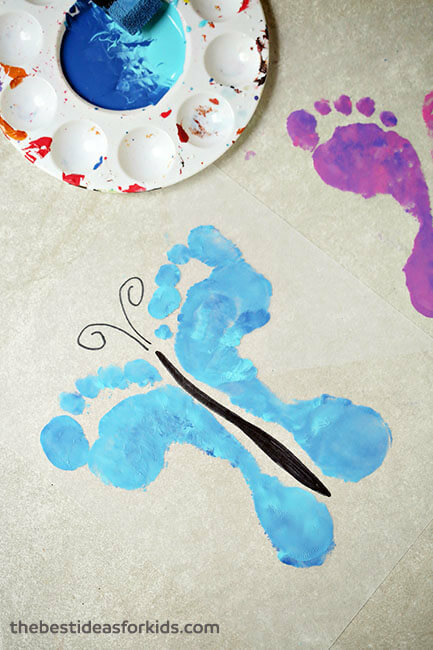 First, paint your child’s foot. Cover completely so the footprint will show up without any missing spots. 2) Place one foot on the Shrinky Dink plastic. Press down firmly to get a good imprint. 3. Do both sides and make opposite footprints to form the wings of the butterfly. 4. 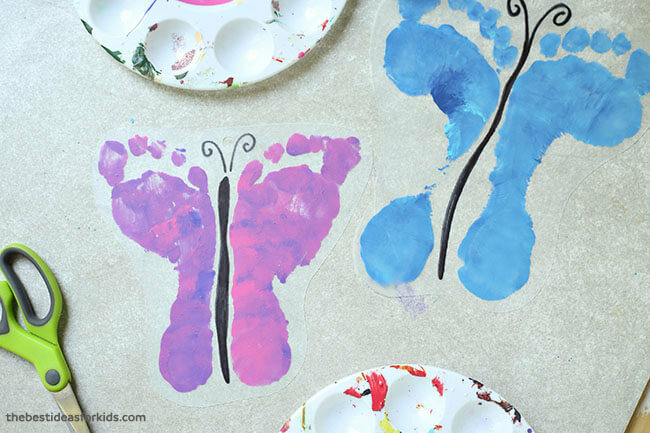 Wait for the paint to dry completely and then draw in the center of the butterfly with a black sharpie. 5. 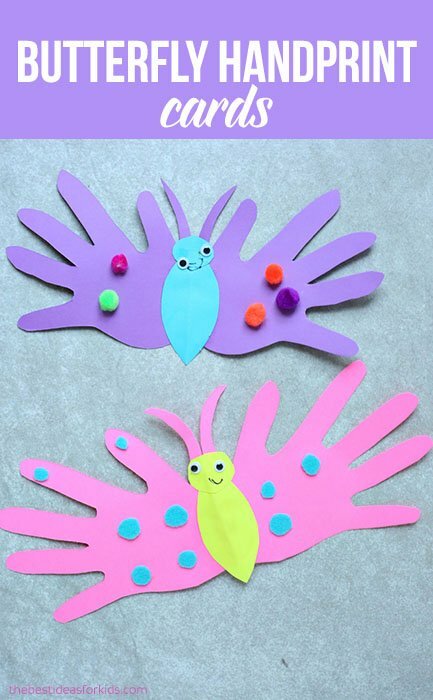 Allow the sharpie to dry, then you can cut around your butterfly. Be sure to leave a spot to hole punch for where your keychain will attach. Remember to punch the hole before you bake! 6. Now bake according to the Shrinky Dink package directions. Place paint side up in the oven and on a parchment paper lined cookie sheet. 7. Paint on gloss mod podge on the side of the paint to protect it from scraping off. 8. Once cool, now the final step is to add your keychains! And that’s it! 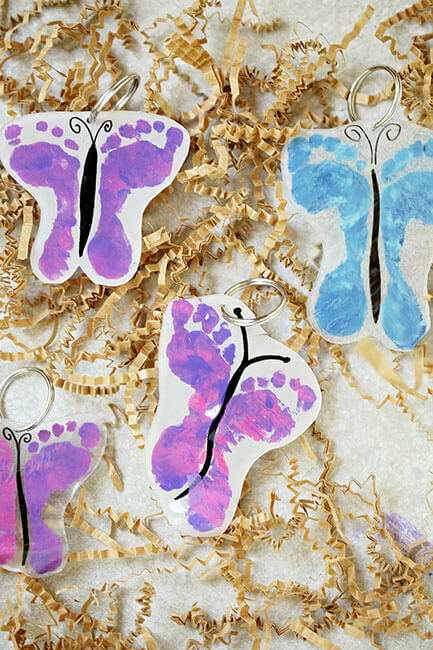 You have your final shrinky dink footprint keychains! You can also just do regular handprint and footprints too. 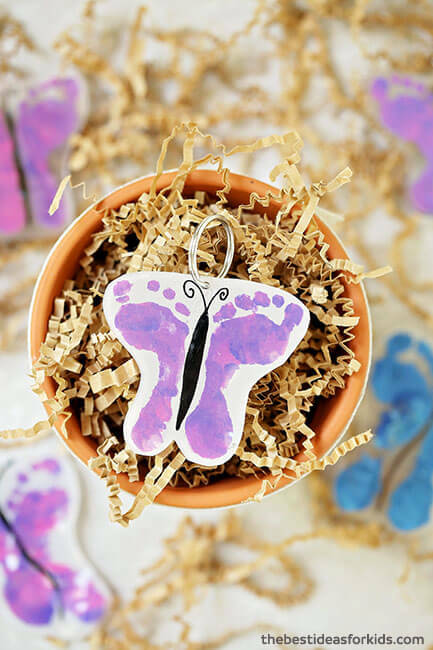 If you’re looking for a card for Mom or for a birthday card idea, check out this tutorial on these adorable handprint butterfly cards. 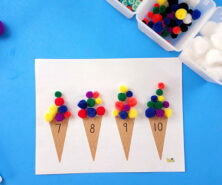 Looking for more footprint and handprint craft ideas? 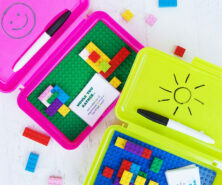 Check out these ideas too! 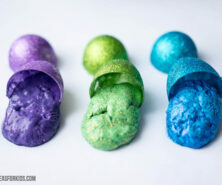 Handprint Salt Dough Craft – this is so pretty and such a nice keepsake! 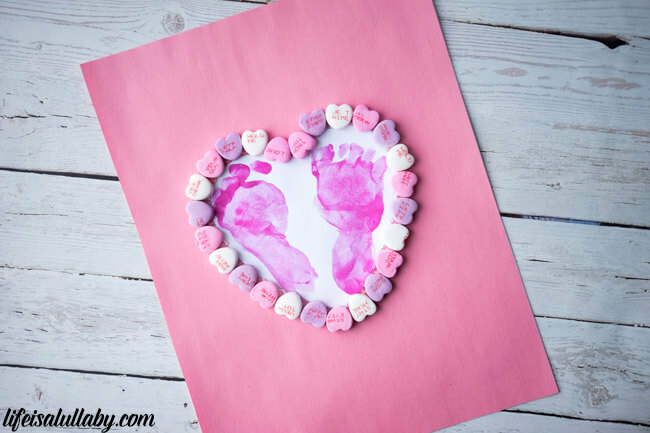 Footprint Heart Craft – this is too sweet! Make a heart out of any type of candy. We used conversation hearts but you could use buttons or any other material to surround the heart. Has anyone made these keychains and then mailed them? Do you think they would be ok in a bubble pouch? They are a little fragile but if you wrap properly I think it would be ok. Does the shrinky dink need to be used with an oven? Can I shrink it in a microwave? You’ll need to follow the package directions of the shrinky dink paper you buy. The one we bought directions said to bake in the oven. I haven’t seen one that allows for the microwave.